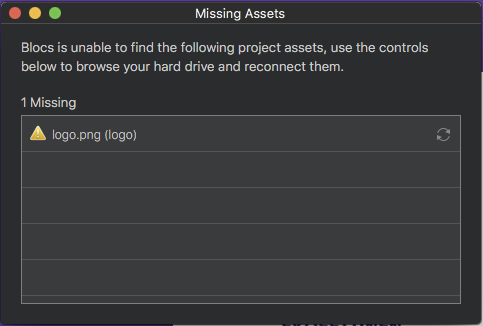 Why I get each time the file is opened following message. And I don’t have any file with the name of “logo” on my sites. I have changed the menu font with Classes. The menu texts look ok on the Blocks App. But when you see it on the Browser, the font is not the same. The missing logo warning can be removed in Blocs 2.4.3 beta build 2 by right clicking it and selecting remove. It was a bug that’s now fixed in that build. How did you set the menu font? Via project settings or sidebar? Menu font is set with Classes. Why the Data Sourse have to be set to None, when using Classes? And the Data Source have to be set back to Primary Menu if you like to add a new menu. You can change the font with custom classes on the navbar using a child element. First, select the Bloc for the navigation. Add a custom class to the Bloc (example uses nav-font). Then edit the custom class (with space and a). This will change all the text on _a_nchors within the navbar. You can also change the color. one question teefers: how the data source of menu text bric should be; none or primary menu? Or have this any matter of the function of child element. Why the letter “a” must write after “nav-font”? 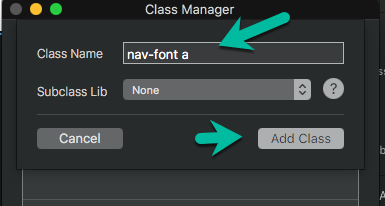 And, why we first place have to write the “nav-font” in to the Classes and then build a new class “nav-font a” in the Class Manager? Should work with any source for the menu manager. The a is an HTML tag, just like p, h1, h2, etc. it’s an anchor tag(link). All the text in your menu items are contained within in anchor tags <a> . So what you’re doing is applying a CSS class name ( in the example nav-font) to the menu, then using a CSS selector to tell the browser that any anchor tag it finds that has that class name should use that format. class “nav-font a” works fine when you make a whole new page. But when I’ll trying to do the same in my existing page the font looks right in Blocs App. But preview in Safari looks not same. I have also take off the existing Header and make completely new one. 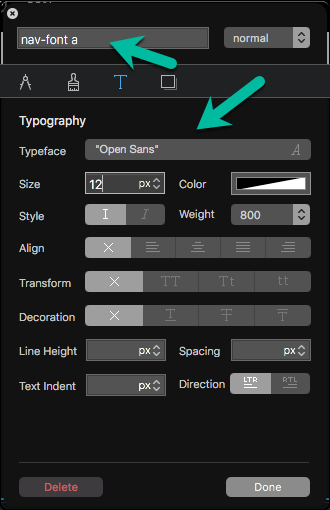 I like to have Opens Sans: 800 but on preview the font still looks like Helvetica. Don’t know what problem you’re having. I have just tried it on an existing page, and it previews and publishes(export) fine on Chrome, Firefox, and Safari (latest version of each). Did the existing page(s) have any other classes applied to the menu? If you have publishes any of these pages, even a test page, do you have a URL? I would be happy to take a look and see what you may have done differently. Hi teefers, No I know what was my problem with this menu font. I have to empty the history in Safari after I have changed the menu settings in the Class Manager. Now the menu text looks as I like it to do. 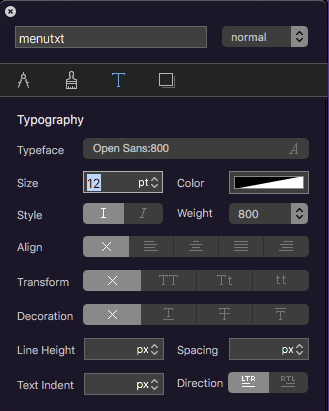 By the way; why we first add “nav-font” in to the Classes and then right after in Class Manager we add “nav-font a”? In the “nav-font” we have not any font attributes! Why we need it? You’re doing a CSS child selector. The nav-font is a class name, it’s applied to the parent in this case. The a is an html tag (anchor), just like p or h1 . You’re telling the browser that any anchor tag you find that is a child of an element that has a class of nav-font apply this styling.